Tonight, the waxing gibbous moon shines close to Castor and Pollux, the constellation Gemini’s two brightest stars. 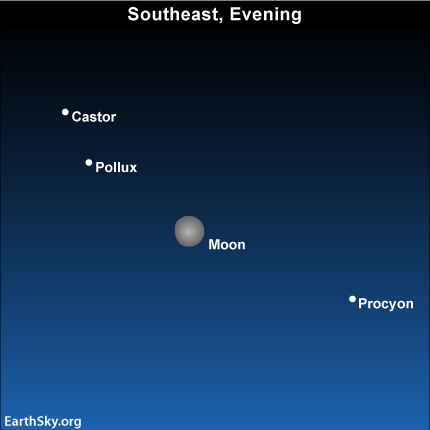 Although the brilliant moon will obscure much of the starry heavens, Castor and Pollux will probably be able to withstand tonight’s lunar glare. When the moon leaves the evening sky by the last week of February, you can use the constellation Orion’s two brightest stars to locate these bright Gemini stars. Draw an imaginary line from the Orion star Rigel through the Orion star Betelgeuse to star-hop to Castor and Pollux. Try this trick tonight. Then try it again on a dark, moonless night. In mythology, Castor and Pollux are often portrayed as Twins. 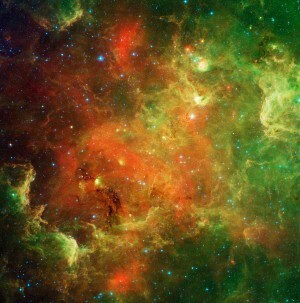 However, these two stars are not physically related but happen to reside along the same line of sight. Pollux, the brighter star, lies about 34 light-years distant, whereas Castor lodges 52 light-years away. Moreover, Castor and Pollux are different types of stars. Castor’s white color indicates a hot, youthful star. Pollux’s orange complexion tells us that it is a cool and oldish star. On this moonlit night, you may need binoculars to discern stellar color. Why do stars have different colors? Starting at nightfall this Tuesday night, you can watch the moon, Castor and Pollux sailing westward across the sky together nearly all night long! Site contents copyright © 2019 Recorder Online	except as noted. All rights reserved. | 83 queries in 1.199 seconds.